Pay respects to your ancestors! Click on the big picture to download the set, or download select individual objects by clicking on single object shots. 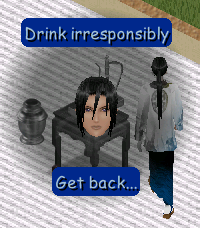 These Sims 1 objects are created by Expression (me!). Read the object description for Expansion Pack requirement and other awesome info! Host a feast in honor of all your lost ancestors! Choose between the decadent whole roast pig and humongous gooey roe the size of your eye ball. Hear yourself and your ancestors scream while you eat! Please note: the pig may feel offended if you think it looks like a mouse. Sims will scream when they eat (sounds from LL)! Mourning your lost ancestors can drain your mood and energy. 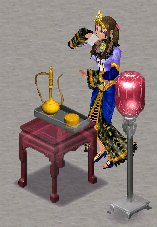 Replenish with the Lost Ancestry dangerous drink! Depending on your ancestry, personality, and random property, this drink can have different effects. Best yet, it may instantly kill you at random to give you a chance to join your ancestors! Can also bring you back in case you don’t mingle well with them. Can have various effects on Sims. Carries a lethal risk. Can also bring back a healthy version of the dead. Tired of mourning your lost ancestors? 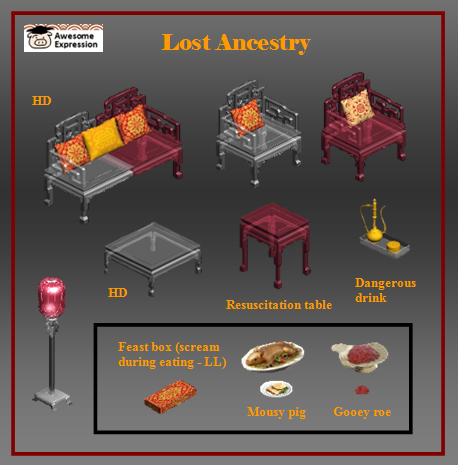 Bring their lazy bones back to life with the Lost Ancestry Resuscitation Table! Reclaim ownership of your house by making them your living tenants instead of dead ancestors! Familial bliss not guaranteed. When an urn is placed on this table, the table can be used to resurrect a zombie version of the dead sim. It usually works, but not always.